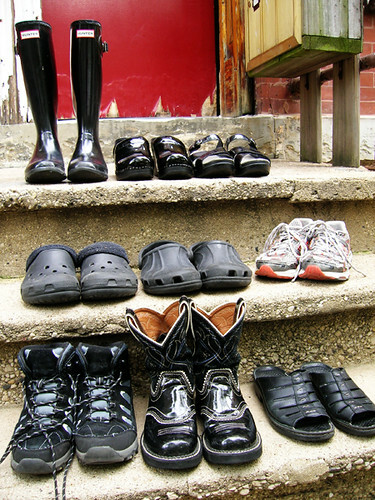 I actually wear the fleece crocs for winter/spring and the slingback crocs for summer/fall, I just could not make myself buy a third pair of crocs that I only wear in the house. At no time do I not wear socks in the house, I can't stand feeling grit on the bottom of my feet; so in winter and spring I wear the fleece crocs with white crew socks and in summer and fall I wear the slingback crocs with white noshow socks, sort of on the theory that you dress for lingering cold in spring and for lingering warmth in fall. And obviously it would be ridiculously extravagant to have a different pair of gym shoes for every season, better to just wear the same shoes year round until they're worn out and then replace them. Probably running shoes should be replaced every year if you actually run, which I don't. Actually this pair is going on three years, I bought them as a Fury rookie because they were white and orange and black.